I love lemongrass, but I hate throwing away all of those beautiful and fragrant stalks since only the heart is usable in most thai dishes. 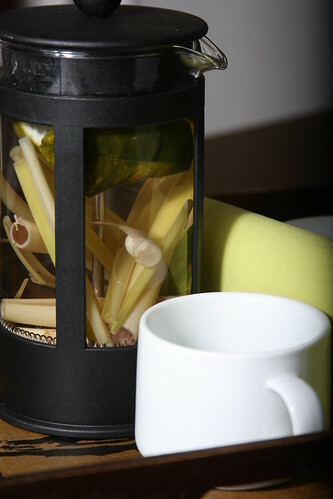 I’ve found that steeping those stalks in hot water is a great way to enjoy some mild tea—it also pairs perfectly with any thai or asian dish. It’s clean and simple and can easily be combined with other fruits and herbs. You can steep this in a saucepan on the stove and serve or place in a Bodum coffee press (pictured) to serve. Combine all ingredients in a saucepan or coffee press. Add boiling water and let steep for at least 10 minutes before drinking. There’s no need to remove the components from the water, since the flavor is so mild. Brilliant! I love using lemongrass, too, and hadn't really figured out what to do with it except to throw it into the stock pot when I make veggie broth. This looks delicious.